Safeties Micah Hyde and Ha Ha Clinton-Dix have been the communication and organization leaders for the Packers defense. 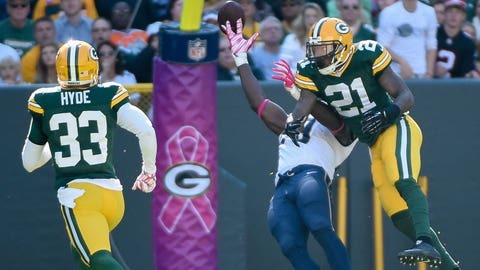 GREEN BAY, Wis. — The Packers’ youthful secondary has more than weathered the absence of veteran safety Morgan Burnett the past few weeks. Green Bay, in fact, is thriving. Defensive backs are taking advantage of one of the league’s best pass rushes and capitalizing on quarterback mistakes. Coach Mike McCarthy likes how Micah Hyde and Ha Ha Clinton-Dix are filling the communication void with the vocal Burnett working his way back from a nagging calf injury. "It starts up front, and then ends in the back end," cornerback Casey Hayward said Thursday. After missing four of five games, Burnett has returned to practice on a limited basis. Not too long ago, Burnett’s absence could have been a big problem. Burnett, strong especially against the run, has started all 65 games he has played in the NFL since getting drafted in the third round out of Georgia Tech in 2010. So far, jack-of-all-trades Hyde has more than capably filled in for Burnett. A fifth-round draft pick in 2013, Hyde is already a starter, though he normally serves in a hybrid cornerback-safety role. Clinton-Dix, who has a team-high 34 tackles, has been solid since a relatively tough game in the season opener against Chicago. He has made 15 starts in 21 games at safety since getting drafted in the first round in 2014. "It helps when guys have been at the position for a couple years … where they’ve got more of a background," defensive coordinator Dom Capers said this week. "Those guys have done a nice job of communicating because Morgan is a big factor in our communication back there." The combination of the pass rush and an athletic secondary made for a terrible afternoon last week for Rams quarterback Nick Foles, who got sacked three times and tossed four interceptions. Two picks came deep in Packers territory. At cornerback, McCarthy thinks Sam Shields is playing the best football of his six-year career. Second-round draft pick Quinten Rollins had two interceptions last week, and first-rounder Damarious Randall has also played well in joining Hayward in what has become a quick cornerback group. The defensive backs will to need to keep talking it out to contend with Rivers, who is sixth in the league with a 103.9 passer rating. Rivers also has his favorite target, Antonio Gates, back after the tight end returned last week from a four-game PED suspension. "You can’t really just shut those guys down," Hayward said. "On defense, we just want to slow him down, get some quarterback hits, stop the run — it will help playing (well) on the back end." Getting Burnett back would help, too. If he doesn’t return this week, McCarthy still loves what he has seen from the rest of the secondary. "Our defense is playing with the right attitude. The communication is clearly better than it’s been," McCarthy said. "Guys are on the same page." NOTES: McCarthy said the team was still gathering information on Sean Richardson’s second neck injury in three years and how it might affect the safety’s career. Richardson was placed on season-ending injured reserve on Wednesday after getting hurt in practice last week. Richardson’s agent, Brian Parker, said opinions were being gathered from multiple specialists, including Dr. Robert Watkins, but declined comment on specifics. Watkins, who operated on Richardson the first time, was Peyton Manning’s surgeon after the now-Denver Broncos quarterback had a neck injury with Indianapolis. The 6-foot-2 Richardson was a key contributor on special teams and a top fill-in at safety, and McCarthy lauded his work ethic. "We’re still working through some things, but I know he’s a strong man. I know there’s a lot of love for him in this building and we’ll make the transition," McCarthy said. … LB Nick Perry (shoulder, hand) and DT B.J. Raji (groin) each missed a second day of practice. … RG T.J. Lang (right knee) and WR Davante Adams (left ankle) were limited again. … RT Bryan Bulaga (left knee) and WR Randall Cobb (right shoulder) were limited on Thursday after participating fully for Wednesday’s lighter practice.